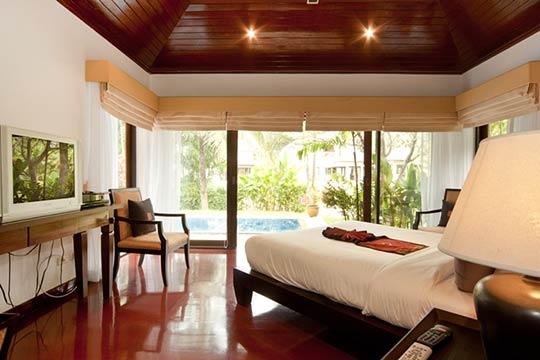 Close to upmarket Surin Beach, Surin Springs Villa 6 is a 4-bedroom property in a tranquil setting overlooking a gorgeous lotus-strewn lake. 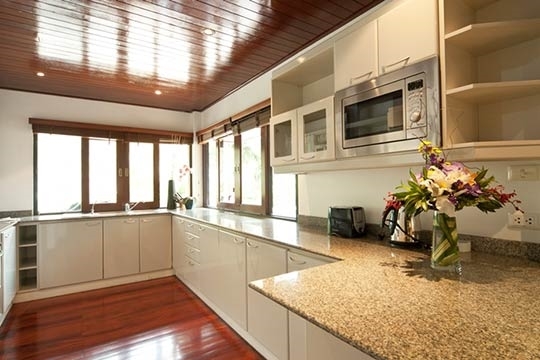 Enhanced by a tropical garden featuring a child-friendly swimming pool, this serviced villa is ideal for families and offers a great base to explore the local area. 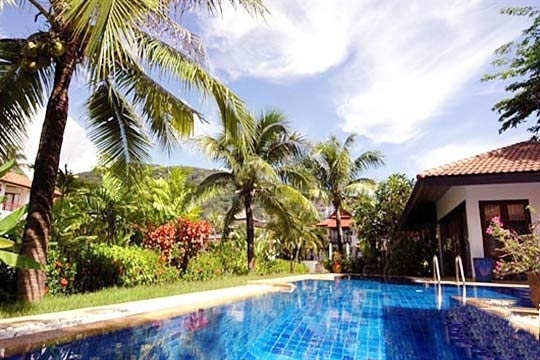 Surin Springs Villa 6 is superbly situated for families, couples and groups looking to explore the picturesque and upmarket area of Surin on Phuket’s sunset coast. The beach at Surin is a beautiful swathe of white sand blessed with spectacular tropical sunsets over the Andaman Sea. Often known as Phuket’s ‘five-star beach’ due to top-end celebrity haunts such as Amanpuri, Twinpalms and The Surin amongst its luxury resorts and villas, Surin features an ever-expanding variety of excellent restaurants and sultry cocktail bars to suit a demanding clientele. 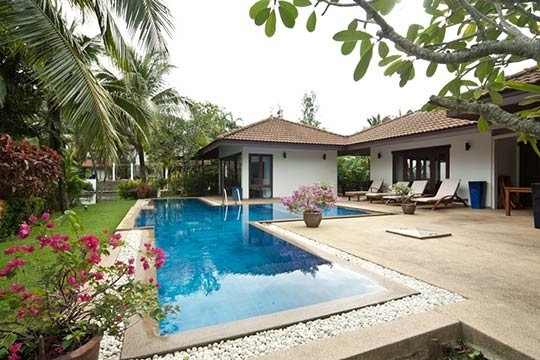 Villa 6 is just a ten-minute walk or two-minute drive from Surin; however its location beside a pretty lotus-scattered lagoon bestows it with a great sense of tranquillity. The swimming pool is overlooked by palms and frangipani blossoms, and is encircled by a grassy lawn and a terrace that offers the perfect place to relax under the hot tropical sun. The pool also has a very shallow section, ideal for little paddlers, enhancing the villa’s family-friendliness. Whilst other villas can be seen beyond the lagoon, Villa 6 retains its privacy courtesy of the tropical vegetation that acts as a natural boundary. At night, the frog chorus provides a sweet accompaniment to dinner! Villa 6 is fully serviced by an efficient management company who are on call 24 hours a day, and a maid visits the villa daily. 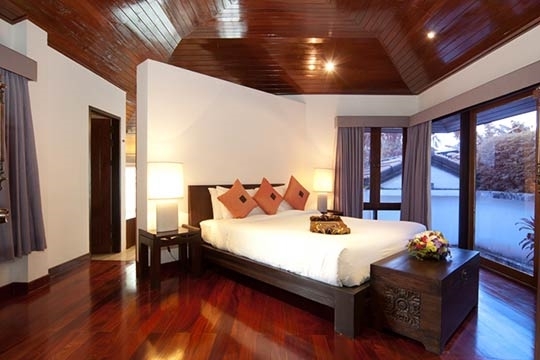 Tranquil lagoon-side setting, only minutes from Surin Beach. Suring Springs is a small private estate of luxury villas and apartments set around a tranquil lake just off Phuket’s main west coast road. A short walk from the estate lies Surin Beach – one of the island’s finest – offering fine white sands bordered by the stunning Andaman Sea on one side and an excellent collection of restaurants, cafes and lounges on the other. The estate has many facilities within walking distance, including a 7-Eleven and an upmarket shopping plaza just beyond the entrance. Access to Villa 6 is up a few steps from the driveway. 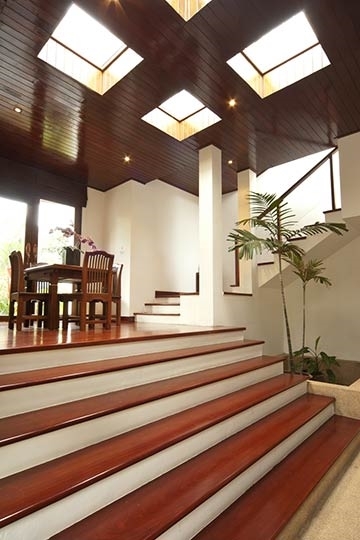 Double doors open into an entrance hall with a staircase leading down to the lounge. A doorway at the side leads to the double garage. 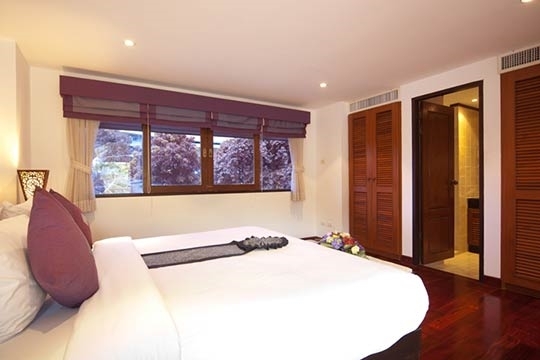 To the right of the entrance hall is a bedroom with queen-size bed, desk, sliding doors onto a private terrace and ensuite with tub and shower. To the left of the entrance up a flight of stairs are two further bedrooms that both open onto a terrace looking down to the swimming pool. 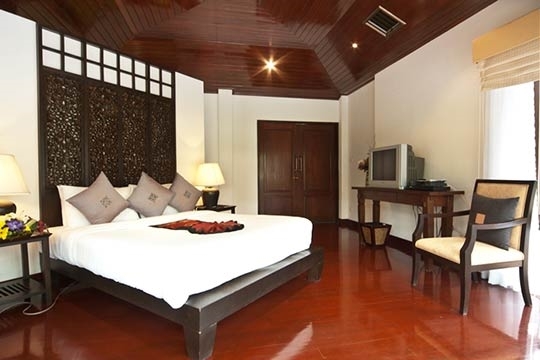 These rooms, one queen-bedded and one with a king-size bed, both feature ensuite bathrooms with shower. On the graound floor beyond the glass double doors is an earth-toned lounge with comfortable rattan chair and sofa seating and two sets of sliding doors that open onto the side garden and pool terrace at the front. This room houses a TV, DVD player and a stereo system. 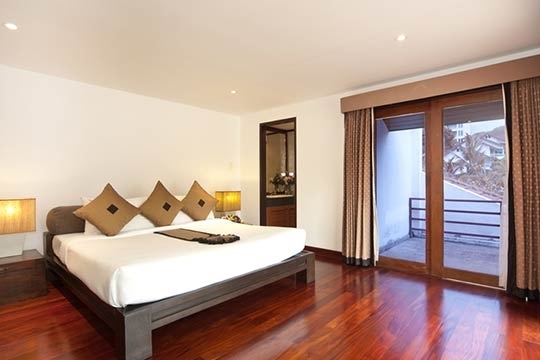 Other creature comforts provided at Villa 6 include WiFi and air conditioning throughout. 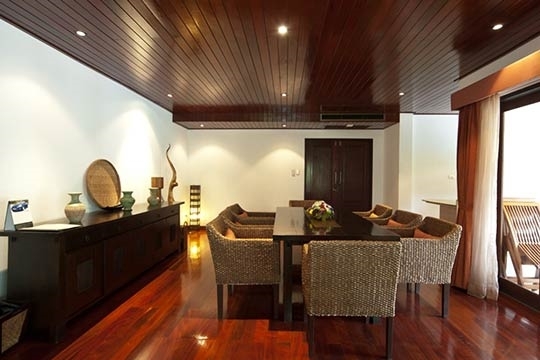 A further set of sliding doors lead from the lounge into the dining room, with a wooden table and rattan chairs for eight. To the front of the dining room is a modern, equipped kitchen whilst folding doors open onto an outside dining terrace opposite the pool with seating for six. At one end of the pool is the master bedroom. With a king size bed, cabinet with TV and DVD player and bathroom with tub and shower, it opens directly onto the pool terrace and has nice views over the lake. At the opposite end of the pool is a small utility room with washing machine that leads into a guest bathroom with shower, ideal for pool users! 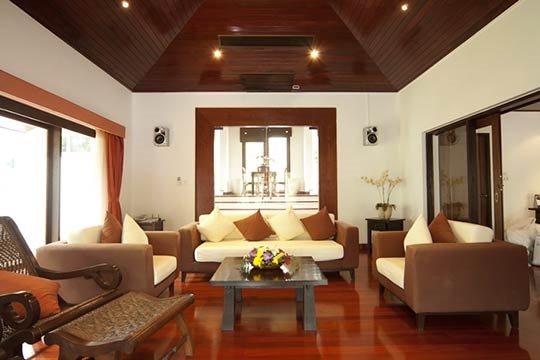 4 bedroom villa located in Surin, Phuket. Ideal for Beach in ten, Body and soul, Bring the relatives, Kid friendly, Going for golf, Room with a view, Walk into town.